Harmonics are great, no two ways about it. They exist at nodal points on the guitar and sound like little diamonds sparkling from the instrument. They often capture the imagination of the audience leaving them wondering: how on earth did she make that beautiful sound? So, seeing as they are so beautiful and magical, we had better not mess them up when we need to play them! They seldom come along in a piece and if you miss-time or miss-pluck the note they make a very dissatisfying thud. A little lump of coal instead of a diamond. The nodal points that I mentioned are points on each string found at exact divisions of the string length. 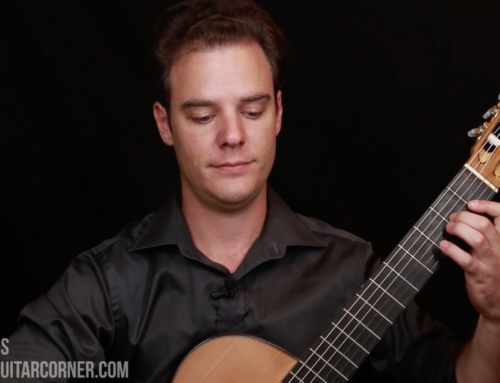 The easiest to find, and easiest harmonic to execute is at the twelfth fret. This nodal point divides the string exactly in half. It is halfway between the nut and the bridge. Unlike playing normal notes, which involves holding down the string right behind each fret, the main nodal points are directly above metal fret. Before we move on lets play the loudest and easiest harmonic on the guitar. Twelfth fret, 6th string. Place the fleshy pad of your 1st finger (left hand) lightly over the twelfth fret. Don’t press it down, just touch it. Now with your right hand thumb play the sixth string and immediately afterwards, remove your left hand finger. Removing the left hand finger quickly can take some coordination to get just right. You need it in contact to create the harmonic, but the sooner it leaves the string after sounding the harmonic with the right hand, the more time the string has to vibrate freely. Now, I mentioned that nodal points create exact divisions of the string. If you repeat that same harmonic, and play the right hand nice and loud, you should be able to observe something quite cool. The string will be very still at the nodal point (in this case it’s the twelfth fret) and in the other parts it will be vibrating, looking a bit blurred to the naked eye. The next step will be to master the harmonics on all six strings along the twelfth fret. As you get to the higher notes, the harmonics get a little more delicate and difficult to execute well. Work on getting a nice “ping” sound that is loud and clear. Finally, you can move away from the twelfth fret and start exploring the seventh and fifth fret. These frets divide the strings up into thirds and quarters, so they will get different, higher harmonics. In the next level we will look at artificial harmonics and also some of the rare open string harmonics.